Audi RS3 is a stunning looking vehicle with breathtaking performance to match. These attributes make it an incredibly desirable vehicle to own but unfortunately thieves also heavily target Audi RS3 for the same reason. 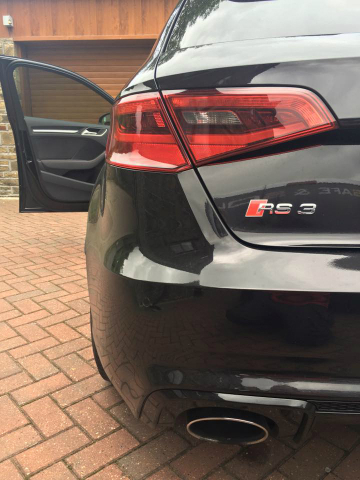 This particular Autowatch Ghost and tracker installation in this Audi RS3 was carried out in Bradford for an existing customer who had previously enjoyed the benefits of the Autowatch Ghost in his Audi RS6. Having bought the Audi RS3 for his wife the customer chose to install the Autowatch Ghost to protect against theft by way of Key Cloning and Key Theft. Wanting to go that step further he chose to install the Smartrack Protector Pro vehicle Tracker to protect against theft by way of car jacking. The Smartrack tracker also comes with a FREE Smartphone app for on demand location reports of the vehicle; handy for when you're away from your vehicle for long periods. With subscription cost of only £12.49 per month after the initial £189.00 for the supply and installation it becomes a very affordable security device giving further peace of mind. With both the above products installed the vehicle is completely locked down from theft by any means. It won't start with the original key, cloned key, new ECU and new Key. Should it be stolen by hiab or towed away then the movement sensor in the tracker will alert you to the movement or if you were subjected to a hijacking then the Smartrack tracker will report the vehicles location with pin point accuracy and once the ignition is turned off the Autowatch Ghost will prevent the Audi RS3 from starting again, allowing the Police to rapidly retrieve your vehicle. Don't forget we offer a mobile installation and fitting of both the Autowatch Ghost and Tracker to not only Audi RS3 models but also many others makes and models too throughout Yorkshire. Our professional and highly trained installers can visit you at your home or work place in areas such as Leeds, Bradford, Wakefield, Harrogate, Halifax, York, Huddersfield, Sheffield, Doncaster, Hull, Beverley, Rochdale and Manchester to name a few! If you would like to know more about the Autowatch Ghost Immobiliser or Smartrack Tracker and how they can protect you and your Audi RS3 then please feel free to contact us either via clicking enquire on the product below of calling us on Leeds 0113 3979597.